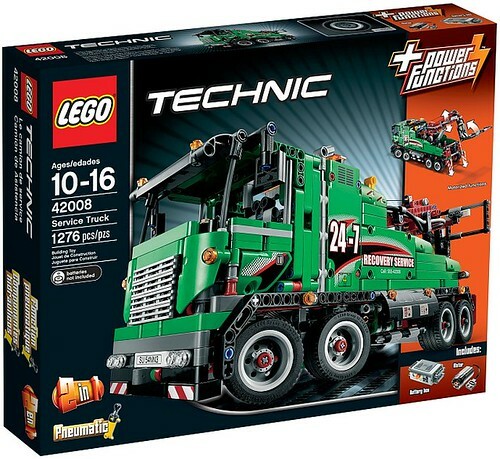 As soon as I saw the first images of this set, I thought I would want it: TLG launched the last large green Technic truck 16 years ago and it's about time we had another one, Plus, its speculated functions were quite promising. You can imagine my delight when I knew I'd be receiving an early copy of the set for review! 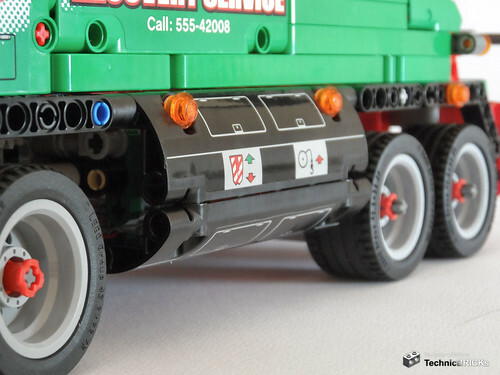 This time, the LEGO Technic Team brings us a tow truck. Tow trucks are less common than expected (that list is just lacking the recent 8109 Flatbed Truck and 9395 Pick-Up Tow Truck). 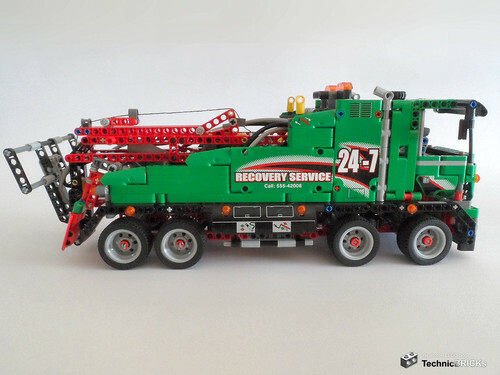 The 42008 depicts a heavy tow truck, perhaps an European counterpart to its American equivalent 8285, the kind used for pulling buses and other trucks, and an example of which can be seen here. The eight wheels, thick lifting boom and large machinery in the centre attest to this. Also, its outriggers, instead of being flat to avoid tipping over (not a worry for a boom that doesn't slew), are blade-shaped to sink in the ground like anchors and thus prevent the truck from being dragged back when pulling heavy loads from, say, mud or snow. The truck features five motorised functions, which is quite a feat for such a (relatively) compact frame. The main functions are raising/lowering the towing boom and extending/retracting the crane attached to it, raising/lowering the wheel lift, deploying/retracting the rear outriggers, and retracting the winch. There is also steering on the front four wheels via a "Hand-of-God" control, and manually opening doors. 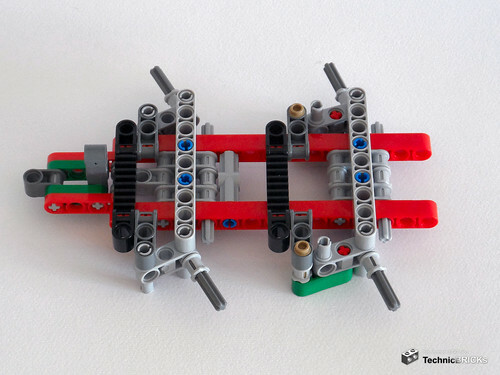 The model features a first in Technic history, what some people even call "heresy": the joining of the two seemingly competing technologies of pneumatic cylinders and linear actuators. 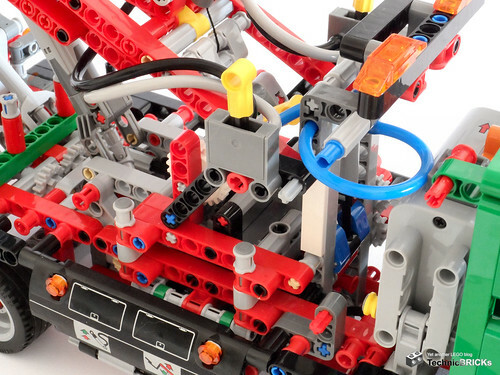 You can read, especially here on TBs and Eurobricks, that I've always been an advocate of the coexistence between LA's and pneumatics, as each system has its own applications, strengths and weaknesses. This set is an opportunity to see how they handle on a single model! In terms of looks, this vehicle is very well done, with a few shortcomings. The proportions are correct for this kind of vehicle, although maybe I'd liked the tyres to have just a little bit more diameter. The panelling work in the sides, (for the most part) smoothly going from the tall cabin to the low rear, is amazing. 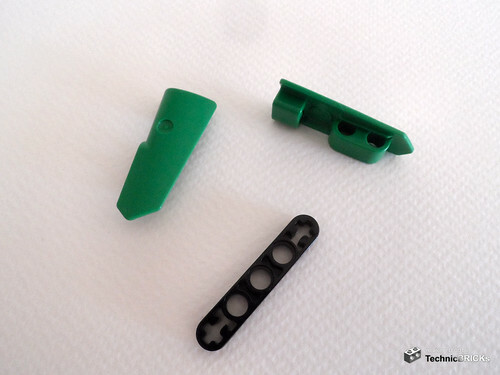 Technic detractors, who in a light-hearted joking way call the theme "LEGO with holes", have one less reason to complain here. 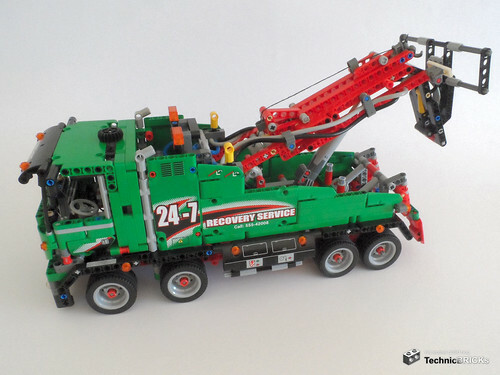 The combination of green body with red machinery (chassis and lifting boom) looks great and refreshing on a theme where yellows and reds and blacks are seen ad nauseam. Speaking of "nauseam", the number of stickers in this set is too darn high! 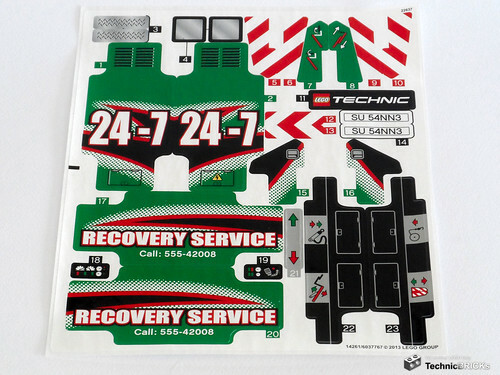 I could swear I felt my soul dying a little bit for each sticker applied… Sure, the model looks great with them, and real-life service trucks have similar paintjobs, but those who like to build a model and them dismantle it for pieces are going to have a hard time. Plus, the B-model doesn't use any stickers, so, if you want to build both models, you may want to build the B first, buy a second copy of the set, or have a model with awkwardly-placed stickers. Not only that, but the larger stickers that go in the equally larger panels are very hard to apply without ending visibly misaligned: I don't remember being able to apply any of those on the first try. I think by now you already know quite well what my personal opinion on stickers is. Besides being a little too small, the front wheels are also too wide. This width resembles more double wheels, which look fine at the rear (and would be well complemented by tyres that feigned double wheels, like the good ol' 7b's) but not at the front. 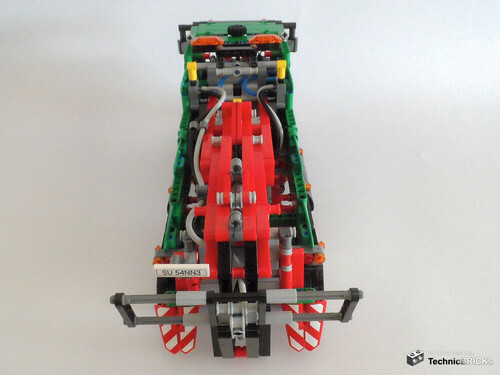 I think TLG would open a whole world of possibilities for smaller "civilian" road vehicles if they created a wheel/tyre combo with half thickness, even if at the same diameter. The front sports headlights and blinkers, together with an imposing engine grille and a license plate. 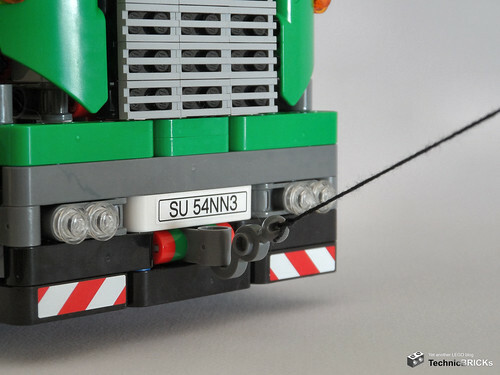 Speaking of which, instead of having an "artist's signature" in some form of "AP 42008" like most Technic license plates have, the 42008's plate reads "SU 54NN3", translating to "Susanne". I wonder what could be the meaning of this? Anyway, moving on. In case the truck itself needs to be towed, it features in its bumper a place to affix a hook. There are more lights over the windshield, a very generous light bar on top, and a flurry of running lights on the sides. 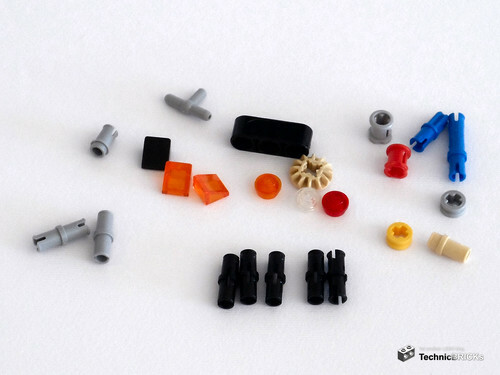 It is notable that, instead of taking the shortcut of placing each trans-orange round 1x1 plate stud-first inside each hole, it is fixed instead using a 1/2 pin, which gives it extra volume and visibility. The rear features tail lights and more blinkers, but no rear-facing spotlight; these are important for operating the towing machinery during the night. Perched on the towing arm is the rear license plate, again with the mysterious "SU 54NN3". The rear outriggers, or should I say "blades" or "spades", have a nice shape, courtesy of the new "micro" panels. However, the green 1x3 thin beams clash quite badly with the surrounding reds and greys. On each side of the truck, between the cabin and the side panels, is a grey smokestack. 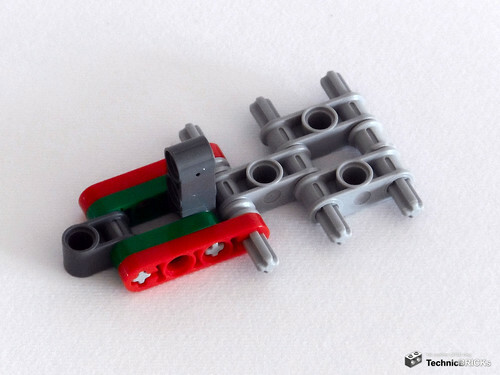 While they for the most part don't look bad, their "pipeness" is somewhat broken by the "bulge" in the middle of each angle connector that constitutes them. The cabin is highly detailed. The traditional "Technic Blue Seats" surprisingly are grey this time, mostly light grey with a darker stripe running along them; quite elegant. There's a steering wheel on the left side, which not only doesn't turn with the wheels, but also doesn't turn at all. A pair of double cheeses with stickers provide a complete instrument panel. The set's box is the usual large affair for a large set. It has the same dimensions as last year's 9396 Helicopter, being just a bit thicker. I believe all this size is still a waste of inner space; it would seem that the 42002 Hovercraft's efficiency is unfortunately the exception rather than the rule. 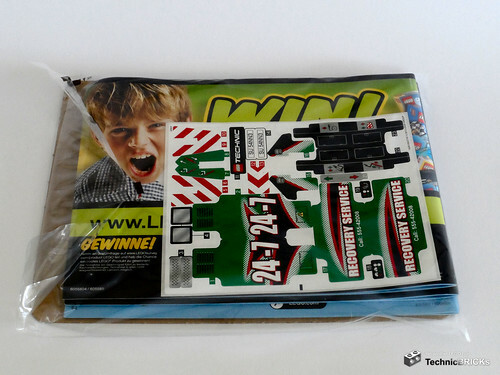 The front of the box is dominated by an action shot of the main model, as usual. 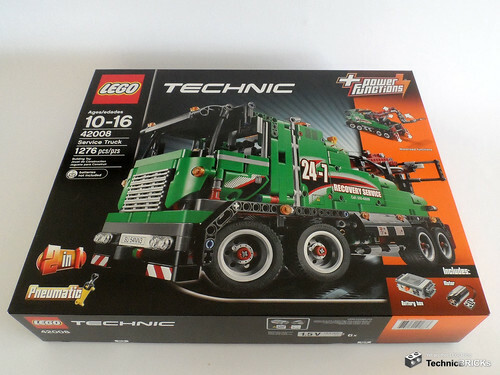 Other customary elements are the LEGO and Technic logos, the recommended age bracket (which every AFOL obviously obeys), the set reference, the "Batteries not included" disclaimer, and the "2 in 1" moniker typical for Technic sets. 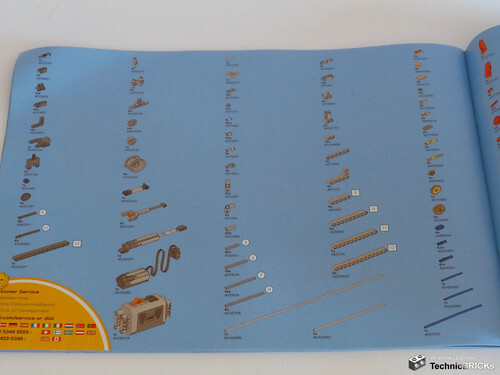 As this particular box is the version intended for North America (USA, Canada and Mexico), there's also an indication of the number of parts and the indication that yes, this is a building toy (in case some absent-minded buyer somehow thinks that the box contains a fully assembled service truck and decides to sue). 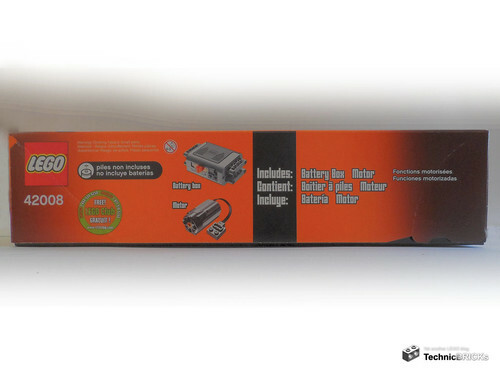 Particular elements in the box are the orange Power Functions stripe at the right edge detailing which PF elements are present, and the Pneumatic logo at the bottom left corner, indicating the presence of, well, pneumatic elements. 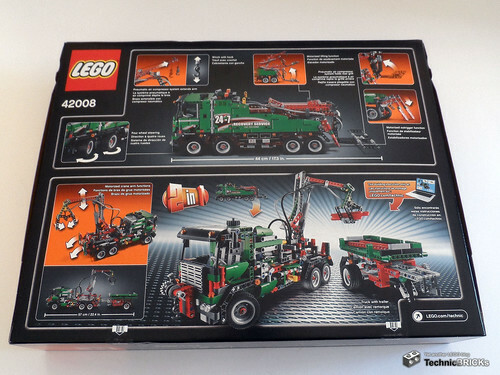 Finally, and like other Technic sets, there's also a smaller image of the model, viewed from another angle with arrows showing some of its functions. The top of the box, besides the usual stuff present on all sides, indicates the provenience of its contents, and the 1:1 image to help give an idea of the size of the real model. In the case of the 42008, the image chosen is one of the wheels. 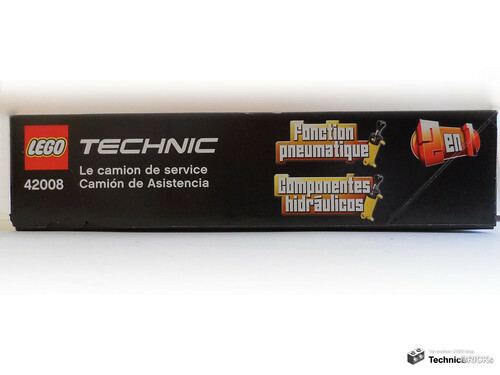 The left side of the box contains the name of the set and the reference to pneumatic elements, in French and Spanish (the English versions are at the front). The Spanish translation is notable in that it erroneously has "hidráulicos" ("hydraulic") instead of "neumáticos" ("pneumatic"). The right side, which continues the orange stripe at the front, shows again the two PF elements included in the set. The back of the box is quite crowded indeed! It's divided in two main parts: the one at the top shows a comprehensive list of functions for the A-model, as well as its length. This time, the Spanish text correctly reads "neumático" instead of "hidráulico". 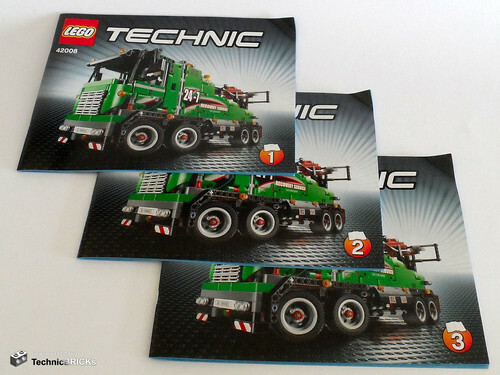 The bottom section shows what the B-model looks like, what it does, and that its instructions are to be downloaded from the Technic site. 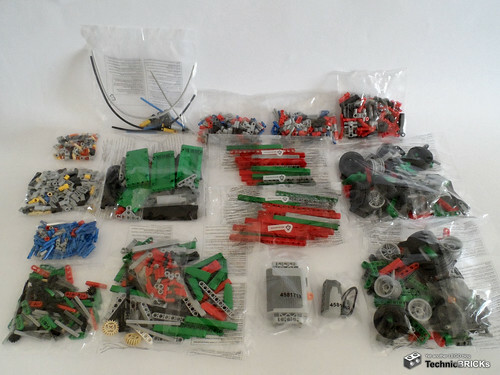 After cutting the seals at the bottom and tearing the "ears" at the sides, the usual for large Technic sets, we get the goodies inside: 16 unnumbered bags. The motor, the battery box and the pneumatic elements (pump, switches, cylinders and pre-cut tubing) have their own bags, and there are 6 "twins": pairs of bags that have the same contents. Inside another plastic bag, we get the three instruction booklets for the A-model, a DSS, and the cardboard backing to protect them. There are no new parts unique to this set, but instead some that are new for 2013. One of those parts is a single reinforced 8T gear (I forgot it in the photo below), which has stronger teeth than its previous version and doesn't hide away inside beam holes. There are also four of the new 5L beams with axle holes, first seen on this year's 42000 Grand Prix Racer. The smallest panels, also new for this year, are also present, in red and for the first time in green. 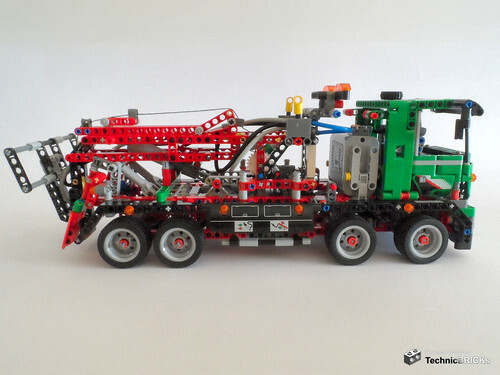 Besides the usual selection of beams, connectors, gears and whatnot, we also get 3 LA's (two small, 1 big), 4 tan axles with centre stop, 2 4L axle/pin connectors perpendicular, 1 M motor, 2 small pneumatic cylinders, and 1 6L pneumatic pump (until now exclusive to the 8110 Mercedes-Benz Unimog U400). Surprisingly, there are absolutely no frames (of either type) present in this set. Nowadays, given the usefulness of these parts for rigidity in studless constructions, this is a rarity. 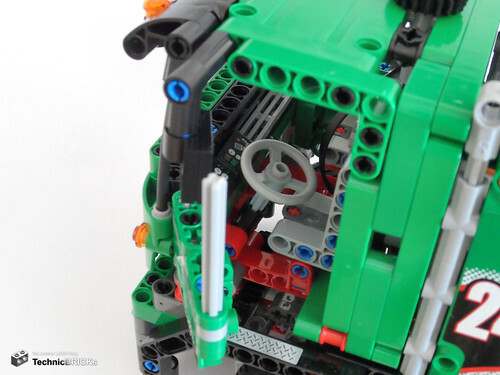 It is also worth noting that, unlike the 42009 Mobile Crane MK II and the 45560 Education EV3 Expansion Set, the quarter-cylinder panels this set uses are of the "old variety", instead of the "new" one (not yet at BrickLink at the time of writing; you can see it here) with more holes. Does this mean that the two versions of the mould will coexist, or that this set was designed before the new version appeared and is one of the last places where we can find the old version? 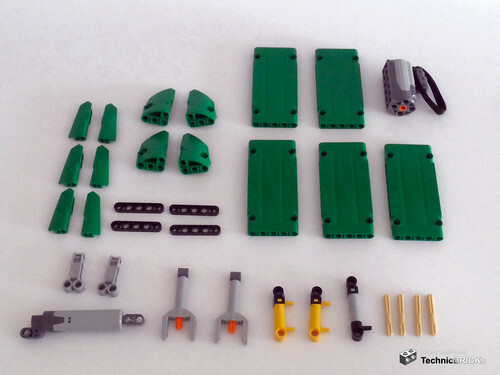 According to BrickLink, so far this is the only set containing 1x7, 1x9, and 1x13 beams in green. Below is an overview of the full inventory. After opening all bags and more-or-less sorting them in some trays, the construction starts. Below is one of the first steps of the instructions, already hinting at the red-green-bley theme that will accompany us throughout the build. We can already see a curious peculiarity of this set: all thin 1x3 beams are green, there is no other colour included. This means there will be some colour clashes later on. 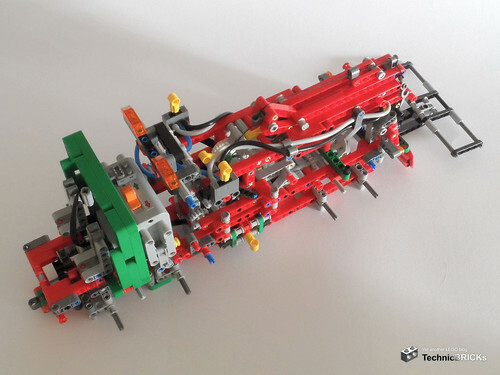 Sometime later, the two steering axles are in place. Like with the 42009 Mobile Crane MK II reviewed here, the different steering angles are accomplished using steering arms of different angles instead of different gearing between pinions. Now comes the most important sub-assembly: the gearbox (upside down in the photo) that distributes motor power between the five functions. The U-joint on the front right will feed the large LA responsible for lifting the boom. The black 12T gear on the front left will lead to the compressor. The two axles on the back will power the winch and the outriggers. Now the "heart" is complete: the set's core functionality fits in the palm of a hand. The compressor and the winch are installed, as well as the large LA for the boom. The only thing missing is the pair of small LA's, which are mounted later at the rear of the vehicle. You can see below the functions working before motorisation. I take the opportunity of showing the compressor assembly to note an oddity: there's a 1x4 tile attached to the side of the mechanism, whose purpose is a complete mystery to me. Suspecting it could be needed for the B-model, I sifted through its instructions, but I also couldn't find any use for it there. Fast-forward to the end of the second booklet. Almost all red parts have been used, and there is now green begins to appear on the body, not just on some isolated 1x3 beams. The chassis is completed, the boom and outriggers are built, and the PF components are installed. At this stage, the model is practically ready, at least function-wise. 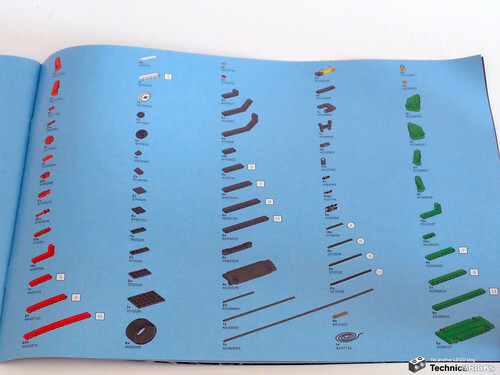 All that is left for the last booklet is basically the huge quantity of green parts to wrap the body. And done! Quite a nifty (and hefty) little dude, if I may say so. Note that the set could sort of live without the huge side panels, but it just wouldn't be the same thing. Besides, they help a bit with reinforcing the cabin roof. These are the leftover parts. Here is an unusually high amount of friction pins and a 1x3 thick beam, possibly intended for the B-model. Finally, time to play... ahem, I mean test the finished model. 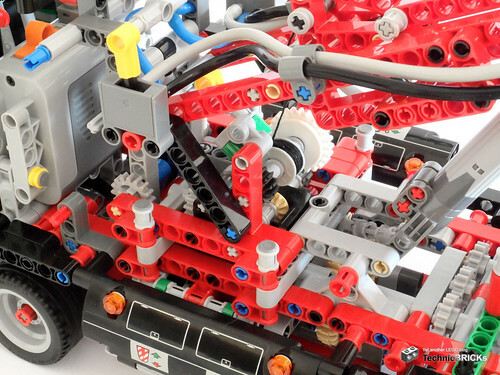 As I wrote before, the set's main functionality involves a motor that, through a four-way gearbox and two pneumatic valves, drives five functions. But, before tackling that, let's see its "auxiliary" functions. And there's the steering. A 20T double bevel gear at the top of the cabin drives a pair of 12T single bevel gears between the two front axles, which then bring motion to two 12T double bevel gears, each paired with a nice rack. 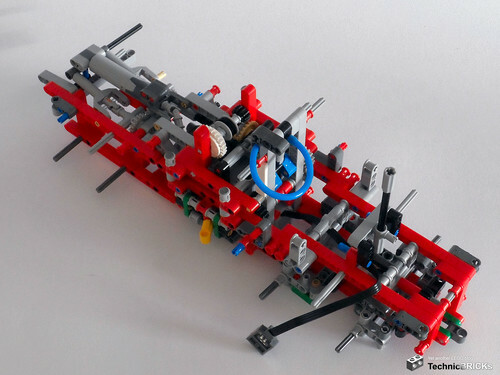 As mentioned before, the two axles turn with different angles, a feature accomplished by steering arms of different lengths. Finally, we get to the juicy part: the motorised functions. Using a four-way gearbox and two pneumatic switches, a single M motor powers five functions, which is commendable for a set this size. Lifting the black fuel tanks (or are they tool boxes?) on the sides reveals yellow levers that control where the power from the motor goes. You can see the whole contraption with the panels removed. Pushing the left lever to the front activates the outriggers. Each one is powered by an mLA and simultaneously extends to the rear and lowers to the ground via a four-bar linkage. 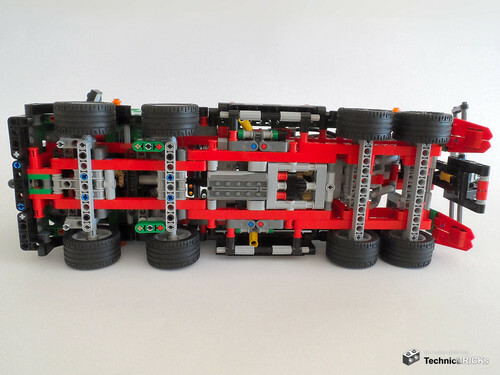 On a solid surface, they extend just far enough below to raise the vehicle and make the rear axle freely spin. My only complaint is aesthetic: the green 1x3 thin beams really don't fit with the rest of the colours. Pushing the left lever to the back makes the motor wind the winch. 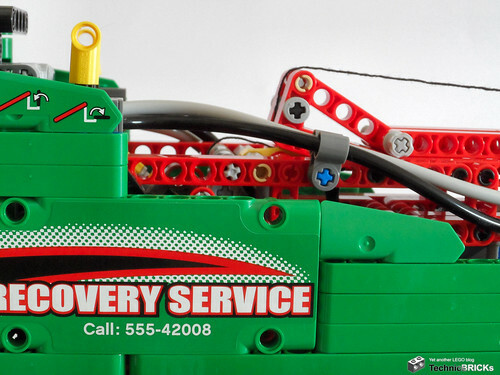 Pay attention to which way you switch the battery box to turn on the motor, as it should be powered in only one direction: unwinding the winch is done manually, by lifting the central yellow lever to disengage the winch's ratchet while pulling the hook. Pushing the right lever to the front connects the motor to the large LA that raises the boom. I'm not an expert in vehicle towing, but I believe that the boom rises a lot more than needed to lift a vehicle's wheels off the ground. Nonetheless, as the boom also has an integrated crane arm, this height is useful. Finally, pushing the right lever to the front activates the pneumatic compressor. 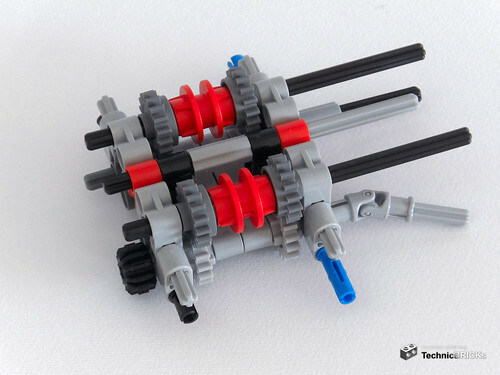 The gear train from the motor to the pump is too complicated and the motor struggles to overcome all that friction. But truth be said, off the top of my head I don't see a simpler-geared alternative while maintaining compactness. With air pressure supplied by the compressor, we can fiddle with the last two functions. Both the wheel lift and the crane telescoping use small cylinders, which have the peculiarity of having high static and low dynamic friction coefficients. In practice, this means that they're hard to start moving, but once moving they're very loose. This, in turn, means that, once you throw the switch, the compressor takes some time to build up enough pressure for the cylinder to "unstick", and then suddenly it jumps into the other extreme position. Usually this is a problem, but in this model the cylinders power functions where precision isn't important. The wheel lift is controlled by the left switch. It goes from parallel to the ground (assuming the lifting boom is all the way down) to almost 90º (limited by the pneumatic tubing). 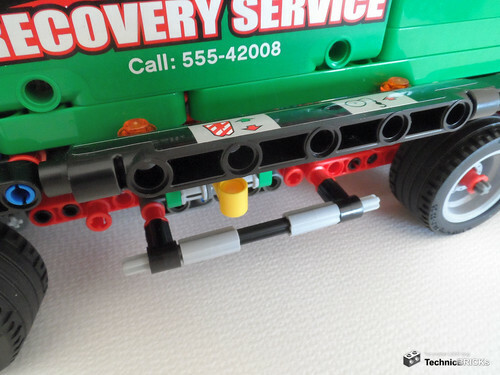 The wheel lift also pivots around its axle, to allow towing vehicles around curves. 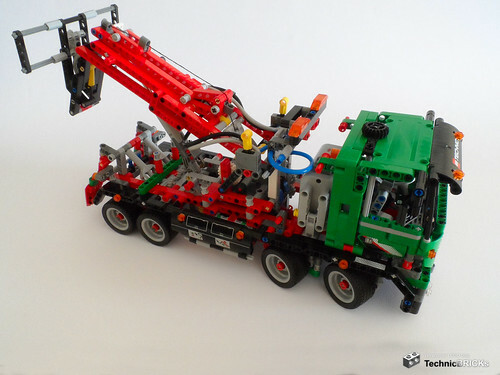 The crane boom extends using a similar mechanism as on some Technic telehandlers such as the 8283 and the 8071-B, but using pneumatics. The small cylinder's innate jumpiness is augmented by the mechanism's speed-multiplying properties, which makes the crane arm move more like a battering ram! In any case, before extending the arm, make sure you have enough cable unwound. To compensate for the previous image-free wall of text, the following video summarises the model's functions and how to operate them. As you can hear on the video, the model lacks a 24T clutch gear to protect the LA's from having to resort to their horrible-sounding internal clutches: only the winch has one. Instead (or in addition of) of being between the gearbox and the winch, that 24T should be located between the motor and the gearbox; that way, all functions would be protected. 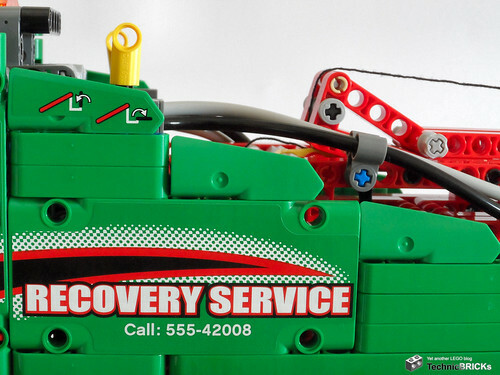 There's one last aspect of playability that needs to be taken in account: the battery box was added during the building process with batteries already inside, but what do we do when the batteries die? We replace them, of course, but how? 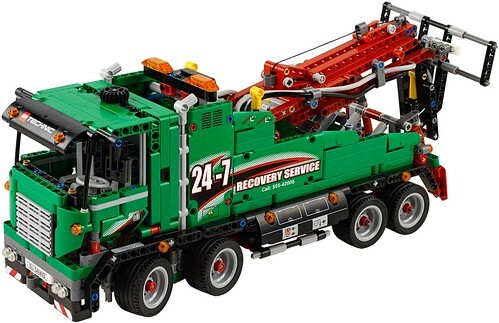 Well, this is, in my opinion, the set's greatest weakness: the battery box is well buried inside the truck, and to change batteries you have to remove the huge side panelling, two axles, and the wire connecting the battery box to the motor, replace the batteries, and then put it all together again. 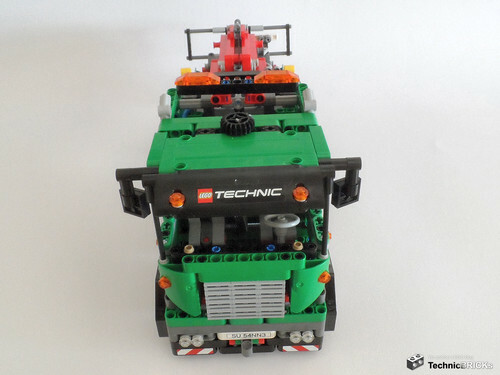 At least those large, flat, triangular constructs gave me an idea for some 80's fun... who said Technic trucks aren't swooshable? Like the description in the box says, it's a truck with trailer. 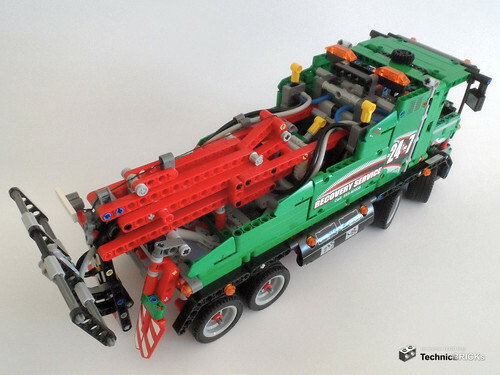 The main vehicle is a six-wheeled machine, with a large grabber arm in the rear capable of slewing, raising/lowering and grabbing stuff (in this case, beams presumably left over from the A-model). It also has rear outriggers that operate similarly to those on the A-model, and a winch at the front. 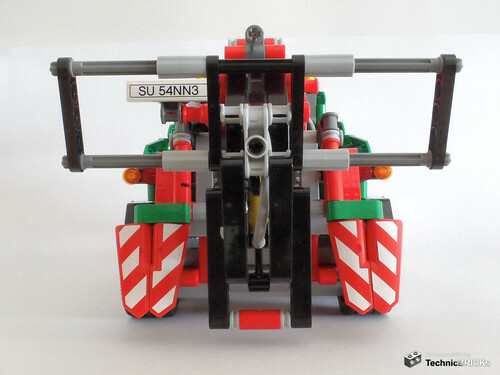 The front wheels turn via a "Hand-of-God" mechanism, and the doors can be manually opened. The two yellow levers, one at each side, control the elevation of the arm, the outriggers and the pneumatic compressor for the grabber. 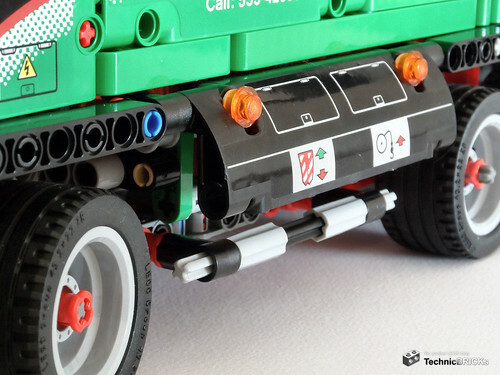 The four-wheeled trailer is able to tilt is bed laterally, and has a landing gear mechanism for when it is uncoupled from the truck. Not having built the B-model, what can I say... Mechanically it's interesting, with the motor powering 3 functions (outriggers, arm luffing, claw), plus 5 other mechanical functions (steering, winch, arm slewing, trailer landing gear, trailer tipping), but aesthetically and logically it's a mess! 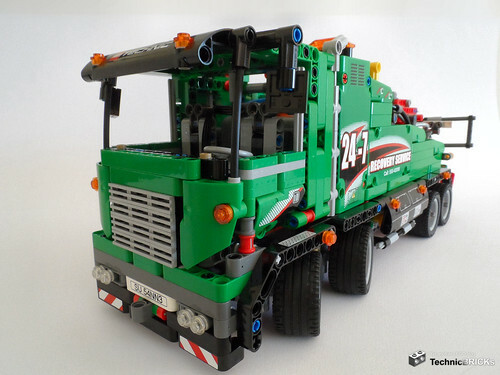 Being build of leftovers from a red and green set, this was bound to happen: while the cab is (almost) homogenous, the truck in general is a mess of pseudo-random reds and greens sprinkled on greys and blacks. The A-model's nice, solid blocks of colour are nowhere to be seen here. 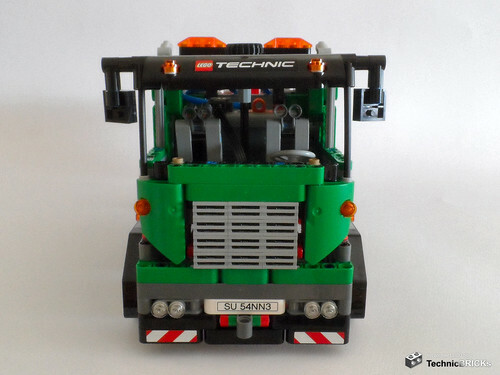 Furthermore, while functional (the truck has one side with the rotation control, and the trailer tips to one side), the lack of visible symmetry also hurts its looks. 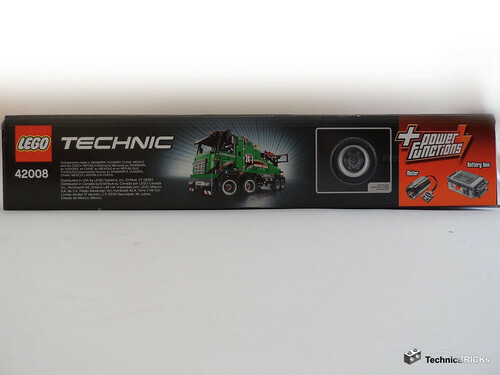 As for logic, why does an obviously on-road vehicle need a front winch? Such a device is needed for off-road vehicles to help getting themselves out of trouble spots, like holes or pools of mud. This kind of truck isn't expected to leave the road, at least not with the kind of tyres it has. For instance, the 8273 Off Road Truck is an example of a six-wheeled truck (also with an onboard loading arm) for which a front winch is fully justifiable. Also, the A-model can do with rear outriggers only because its crane can't slew. This is not the case with the B-model, which is at the danger of tipping when it grabs something heavy because its outriggers extend to the rear instead of to the sides. Finally, the arm has only two degrees of freedom: circular and vertical. This means it can't grab stuff outside of a fixed-radius circumference around it. 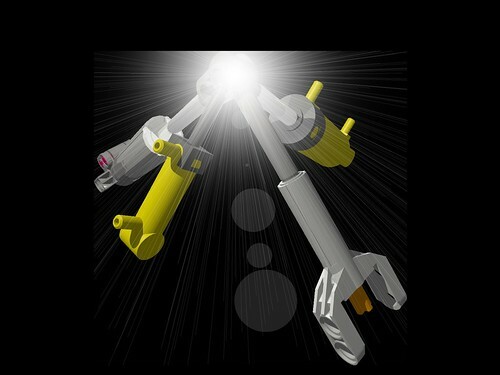 As the set includes two pneumatic cylinders and only one is taken for the claw, I think it wouldn't be very hard to use the other for an "elbow" joint, even considering the "nervous" nature of small cylinders. 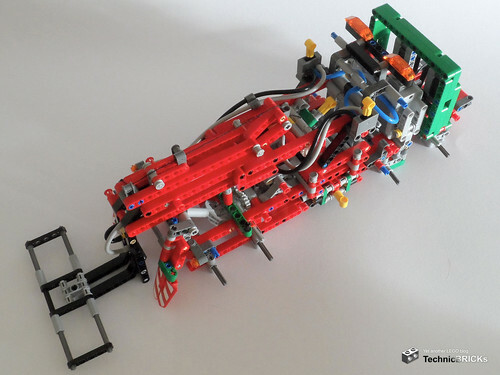 So, for learning building techniques and playing with mechanisms, the B-model might be worth building. For having it on display or talking about it with others... definitely not. 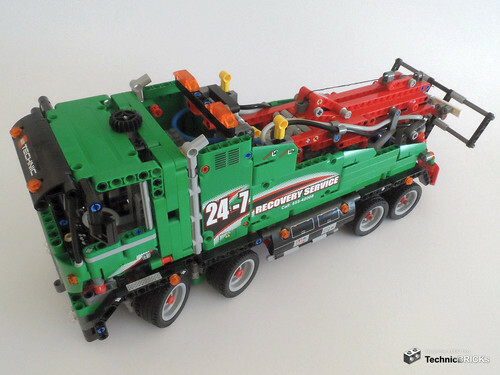 Before finishing this review, I would also like to mention three aspects where the Service Truck looks a little unfinished, perhaps due to budget constraints. One is the lack of 1x3 thin beams in any colour other than green. This makes for a bit of colour clash in some areas of the model, but those who get a set for its parts won't mind at all having more of those in green than in common colours. Since I'm this kind of FOL, I certainly won't! Another is that each of the black boxes on the sides (which I'm still not sure if they're fuel tanks or tool boxes) is built using a single quarter-cylinder panel and a few axles and connectors. When viewed from a lower angle, the model appears to be lacking something there. It really looks as if the model was intended to have a second panel underneath the first, as it would be extremely easy to mount instead of the parts we get. Of course, to maintain access to the lever within, the top panel would need to be detached from the bottom one. The final aspect is on the side panelling. The gentle slope from the cabin to the rear is mostly done with the new smallest panels... except for one section, where the slope staircases a bit. With an extra micro panel in place (raising the total number of green micro-panels in the set to 8), that "step" disappears and the slope looks more continuous. So, the time has come for the ultimate question: Are Linear Actuators better than Pneumatics, or is it the other way around? This set helps answering it, as it showcases the strengths and weaknesses of each system. The lifting boom is, well, lifted using a large LA. With it, you can have it go up or down to the exact position you want, and it will stay there independently of what's hanging from it. The same happens with the outriggers, powered by mLA's. On the other hand, it wouldn't be easy to derive another mechanical function from the gearbox, and care must be taken to ensure that the LA's don't reach their limits, or else you'll hear the Grind Of Doom™. 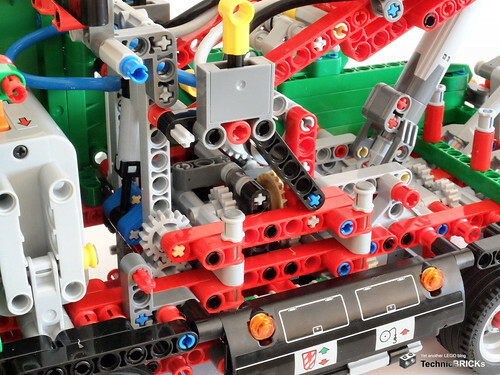 The telescoping crane and the wheel lift showcase the pneumatic cylinders' inherent lack of controllability, augmented by the fact that it's the small variety of cylinders we're using: you either abruptly and fully extend them or abruptly and fully retract them, being practically impossible to stop half-way. And, even if you did, they wouldn't stay there if, for example, a larger weight was placed on the wheel lift. Then again, if you wanted to add another function, like for example rotating the wheel lift, all it would take would be to add an extra switch anywhere and join it with the compressor, run a pair of hoses to the end of the arm, and plop a cylinder there. Good luck doing the same with a mechanical transmission while maintaining simplicity and lightness. Bottom line: which one is best? Both; each one has its uses. This set has its ups (uncommon subject and even more uncommon colours, overall shape, blend of technologies, attention to detail, high function density, rich parts choice) and downs (large stickers, lack of clutch gear, batteries difficult to replace, unfinished details, weak B-model), but to me the ups are stronger than the downs. You may like the model, or the parts selection, or both. Either way, you won't be in for a disappointment. BTW, I believe the white tile 1 x 4 is a replacement for the license plate on the back. 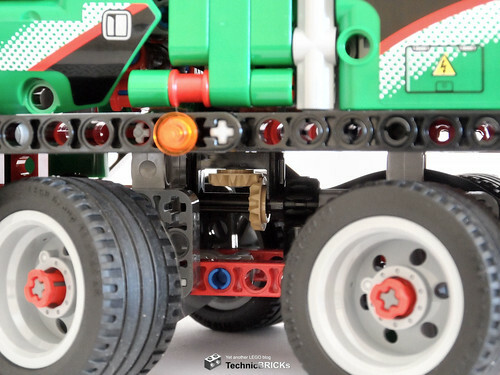 Thing is, Lego already has the smaller wheel/rim (as used in Creator 7347 in the way you propose, and also used in 10220) All they need to do is create new tyres for both wheel/rims. 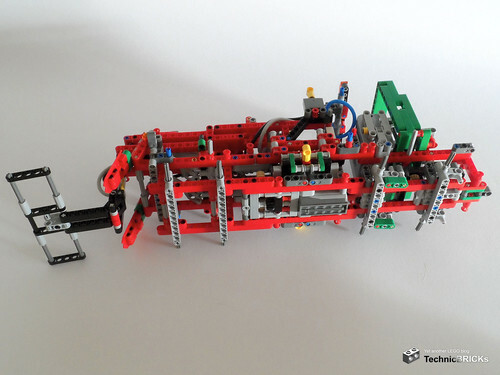 Great review, however I think this set provides an unfair comparison between pneumatics and LAs. It's no secret that I think the standard pneumatics are too small/short. Because of this every single shortcoming of pneumatics(such as not as much control, sudden movements and so on) comes into play slightly (tho i've never had a problem with that). With these tiny versions the shortcoming are many times more obvious. 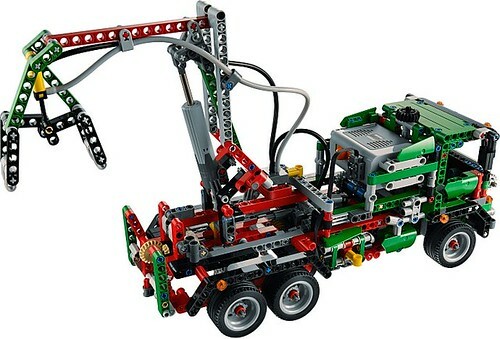 Make them bigger/longer than the standard version and with more friction whilst moving and less friction whilst static and then I think pneumatics would dominate. Imagine having one, maybe two long rams to lift the boom, you could tow the 42009 and the unimog away simultaniously with smooth, controlled movements, plus another to telescope the boom. Now that would be (even more) awesome and I think gives us a better comparison of the potential each system has. I didn't have a leftover 1x3 thick beam or any blue pins, so maybe you missed a bit? And the "missing" panel for the slope is something I also saw immediately. But definitely a great model. @Thebicyclestory: actually, one of the cats wanted to chill out on the photo paper but I didn't let him, as he'd surely get it dirty... And I don't think the tile is replacement for the license plate, as there is no similar spare for the front plate. 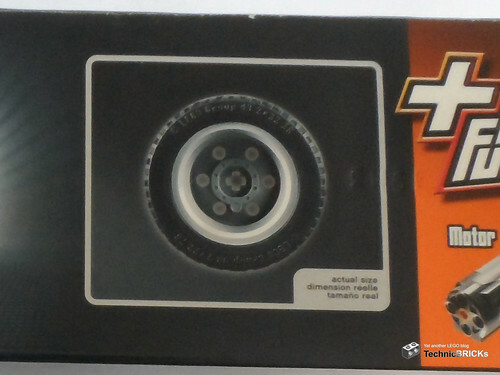 @Sander Otten; I knew those wheels but actually never thought they had the same diameter... probably because I only have them in still sealed sets. But indeed, both wheels really could use more "road-like" tyres. @Allanp: I'm not 100% sure about the cause, but I suspect the reason for the high static and low dynamic frictions are due to the rubber sealing on the cylinder's piston. To have a smoother action, probably the piston would have to be lubricated, with all the implicit problems for a toy intended to be child-safe. @rherberg: Hmm, that's a quite logical explanation, especially considering the abundance of leftover black pins. Yet, the model as it is works well. @Allanp: I think the pneumatics and LAs have been used appropriately, each playing to its strengths - pneumatics for the end-to-end boom extension and fork tip-up and LAs for the variable boom lift and gradual outrigger lowering. So it's great to see them together. I didn't feel the need to make a comparison as such. This one is definitely on my list for the green parts - much easier to fit Technic into layout scenery with green - it's not only grey railway trackbed where Technic actuation is needed! I too suspect the rubber seals, specificly their shape, but I more so suspect it's small size, with only 1/4 the cross sectional area of a standard cylinder you have 1/4the force to overcome the stiction. I am pretty sure the pneumatics are lubricated tho. 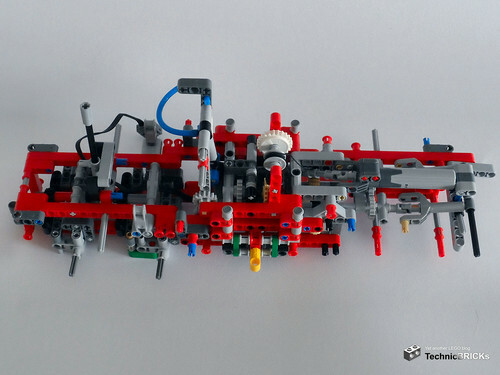 I agree that the pneumatics in their current form (especially their coice of using smaller pneumatics) have been used appropriately, but in a newer form they could be much more useful, controlable and responsive in all areas even without much need for complex feedback loops. However the standard version does not come close to the potencial the pneumatic system as a whole has, the smaller one even further away from it. Yes, friction and stiction are proportional to diameter (2*PI*r) whilst force is proportional to cross-sectional area. Therefore if the cylinder were 4x4 it might balance the parasitic forces better. Unfortunately that's a bit large for most LEGO models! The lubricant is a grease of high stiction rather than an oil of low stiction because it has to help seal the piston against the cylinder wall. There are two rubber parts on the piston so that doubles the friction and stiction. Yeah, 4x4 is way too big, 1x1 is too small. The cross section of the 2x2 is fine, but with a much longer stroke you can use much better leverage which will give you more power and more control. In the case of 42008 a standard cylinder on the wheel mount tilt would be fine and a longer one to telescope the boom without the need for linkages would be great.